In the final week of the ThingLink Teacher Challenge we asked participants to create a lesson to Engage Students with ThingLink for Video. Participants learned to Embed a Google Form in a ThingLink Video to minimize distractions and provide students with direct access to an interactive form without leaving the video. The ability to embed interactive content right inside of a video is very powerful. Let’s take a closer look at 5 interactive tools to embed in ThingLink Video. 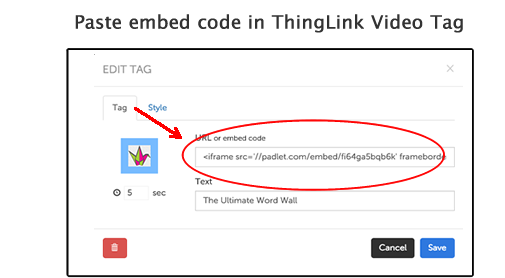 You can copy the embed code from any 3rd party tool with an embed code into ThingLink Video and it will appear live. Once you copy the code, paste it into the box in the tag editor, pictured here. The results are amazing and powerful! To illustrate the use of embedded 3rd party web tools on top of a video, I have used a quick SAMR model video that originated on the site of Dr. Ruben R. Puentedura at www.hippasus.com. Here are the tools embedded in this video to add my own examples of SAMR at each of the levels and more. Please explore it. As educators, we learn the most when we must teach it to someone else. As connected educators in a quickly changing technology driven society, we find ourselves in a much better position for learning when we collaborate and learn from other educators. I was inspired to dig deeper into embedding interactive tools by the video of Sheri Edwards, an educator whose work has been featured in each of the Teacher Challenge Showcases. Sheri came up with the idea of using Padlet with ThingLink Video and it only took 30 seconds for my mind to start racing with ideas for embedding 3rd party tools in ThingLink Video. Please explore this ThingLink Video, by Sheri Edwards. I hope participants will explore the possibilities of embedding their favorite interactive tools in a ThingLink for Video so we can all learn together! The ThingLink Video Showcase is Coming soon!